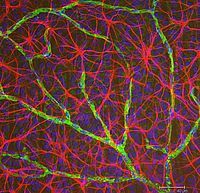 Wholemount retina showing the close relationship between astrocytes and blood vessels. Astrocytes are immnunolabeled with antibodies againts GFAP, which is an intermediate filament protein (red), blood vessels are identified by Griffonia simplicifolia isolectin B4 (green) and ganglion cell nucleus are stained with TO-PRO 3 iodide (blue). 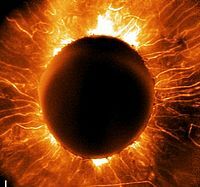 The star-shaped astrocytes and their particular spatial arrangement that are intercalated between vasculature and neurons points to their importante in the uptake of nutrients from the circulation, transfer of energy to neurons maintaining the extracellular environment and modulating synaptic function and plasticity. The astrocytes decrease in number in pathological conditions, when there is either vessel damage with increased permeability of the blood-retinal barrier or a massive loss of neurons. Figure - Connexin43 expression in astrocytes in the rat retina: A gap junction functional syncytium of the central nervous system Connexin43 is intimately involved with cell communication that helps maintain homeostatic function in the central nervous system. Connexin43 is found specific to astrocytes in the retina and forms a dynamic and complex cellular functional syncytium via gap junction intercellular communication. 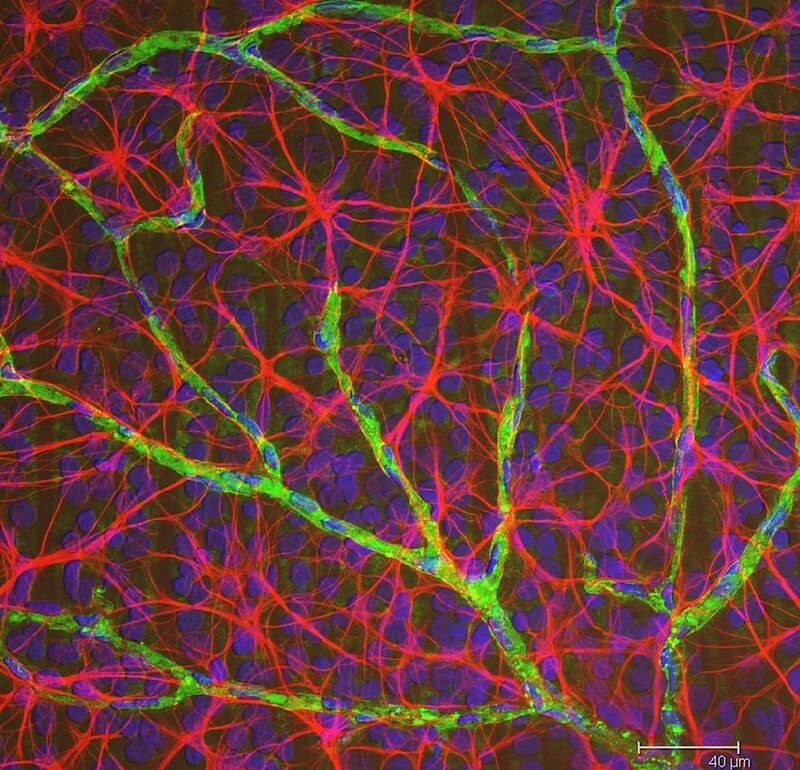 This specimen of an 18 month (aged) Wistar rat retina illustrates connexin43 found among astrocytes that surround blood vessels of the nerve fibre layer. Triple label immunohistochemical staining was performed on the flattened intact retinal whole mounts. 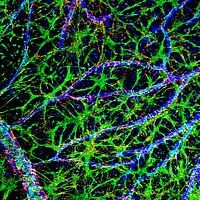 Cconnexin43 stained for gap junctions (red), GFAP stained for astrocytes (green), and GS Lectin B4 stained for blood vessels (blue). Confocal fluorescence microscopy was used to visualise the immunofluorescent labelled markers of astrocyte-vascular interactions and expression of connexin43. Antibodies against connexin43 conjugated with cy3 fluorophores, antibodies against GFAP conjugated with Alexa488 fluorophores and GS Lectin to conjugated with Cy5 fluorophores streptavidin. Source of equipment used; Carl Zeiss LSM 510 META inverted microscope equipped with UV-Argon laser scanning, Axiovert 200M and LSM 510 scan head. The objective lens used was a Plan-Apochromat 20x/0.5. Alexa488 fluorescence was excited at 488 nm, Cy3 at 561 nm and Cy5 at 633 nm. Image captured of optical z-series projection, resolution of 1024 x 1024, and data depth of 12. 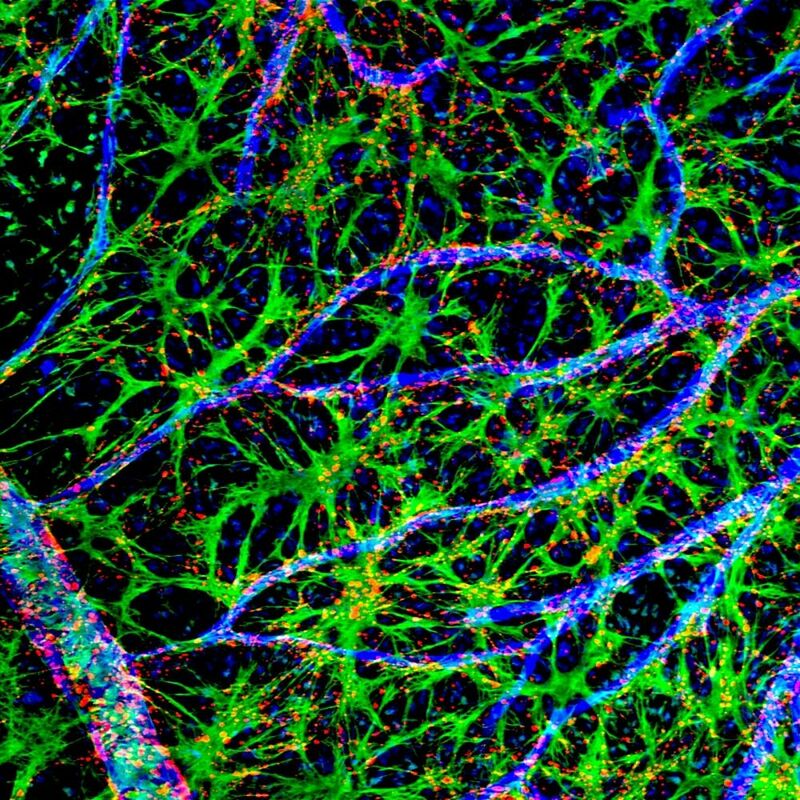 The novelty of this image demonstrates astrocytes are continuously networked throughout the CNS by gap junctions. Connexin43 astrocyte gap junctions serve to regulate exchange of ions and other small molecules, sustain potassium spatial buffering and calcium electrical signalling for cellular vitality and, thus, maintain homeostatic function of the CNS throughout life. 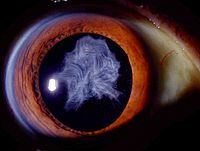 Photo of a posterior capsule opacity, taken with a Topcon Slit Lamp camera. Three-dimensional volumetric reconstruction of intraretinal hemorrhage secondary to thrombocytopenia in a patient with leukemia as seen within the fully-imersive Computer Assisted Virtual-reality Environment (CAVE). 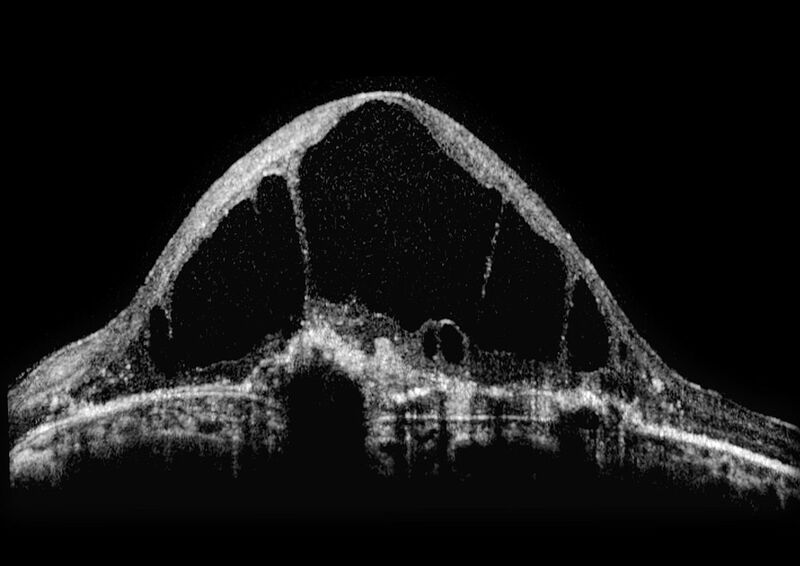 The 3D object was constructed from high-resolution, volumetric optical coherence tomography images from the Heidelberg Spectralis HRA+OCT, slices of which can be seen transposed on the hemorrhage. 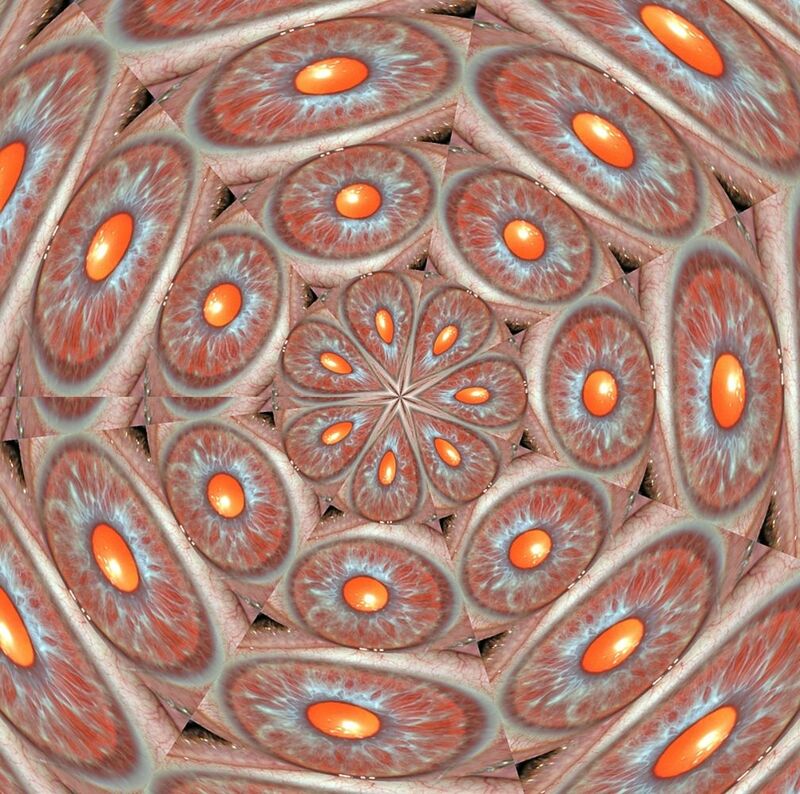 Triple staining of a rat retina after optic nerve crush. 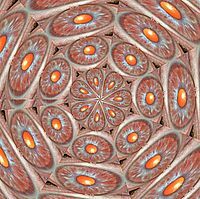 This image shows radially arranged Müller glial cells in a horse uvetic retina. 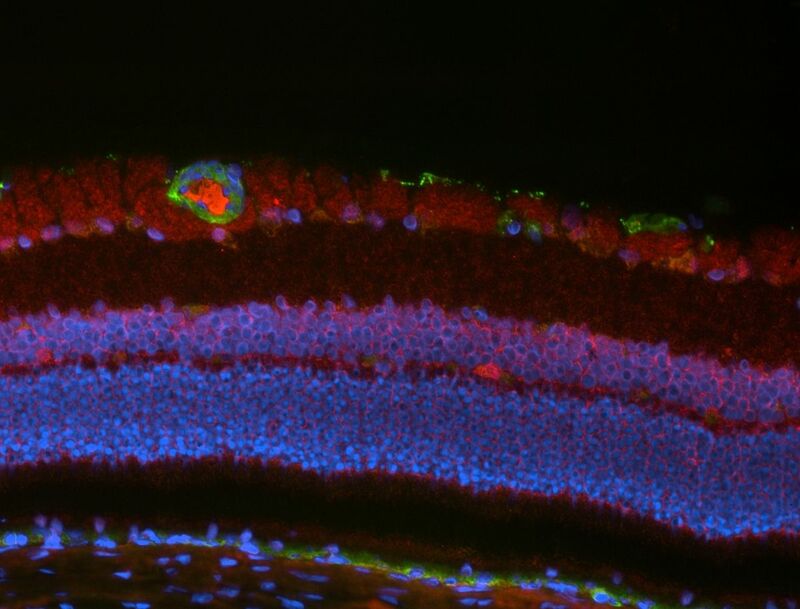 Müller cells provide essentials functions to support neurons in structure, nutrition and metabolism and are therefore involved in a variety of diseases affecting the retina. 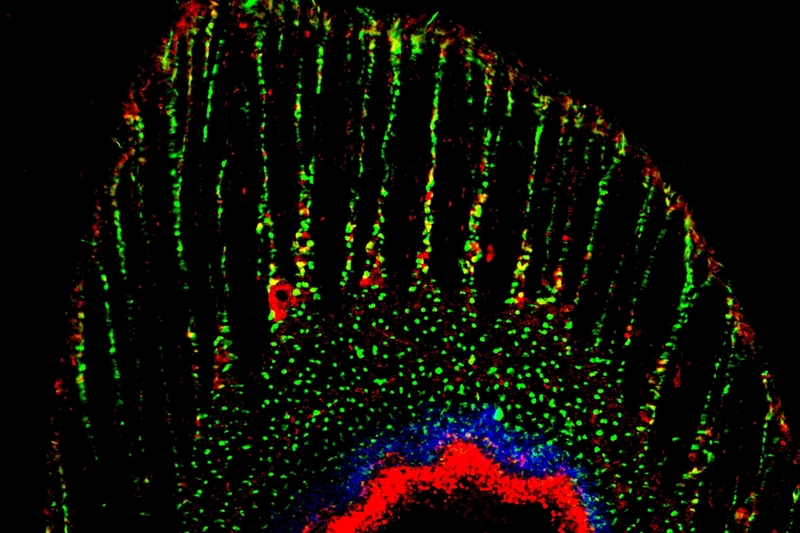 Horse retina section was double immunolabeled with antibodies against the intermediate filament vimentin (green) and a voltage-dependent anion channel (red). 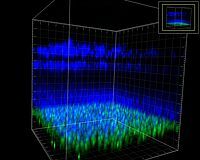 ‘Imaging the image marker’ In the submitted image we use a 2 photon microscope to capture the layered structure of the mammalian retina in 3D. 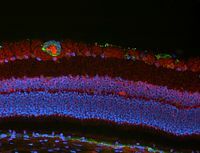 The blue fluorescence stain picks out the nuclei and shows the layers of the retina (ganglion cell layer on top and photoreceptor layer at the bottom), whereas the green fluorescentstain (PNA) shows only the cone photoreceptors. 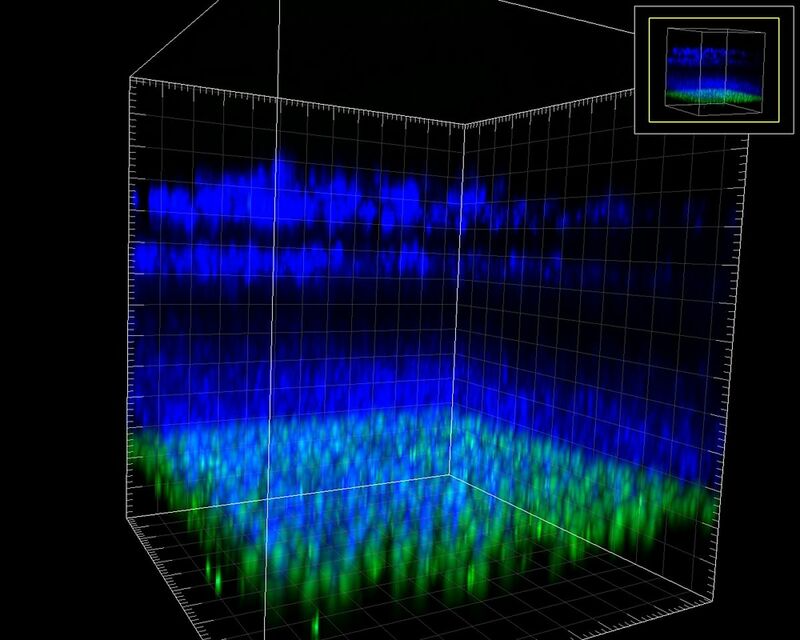 What makes this as yet unpublished image unique is the ability to scan down though the cell layers of the retina using a the 2 photon microscope something that cannot be done with a confocal microscope because of the loss of resolution due to the thickness of the tissue. 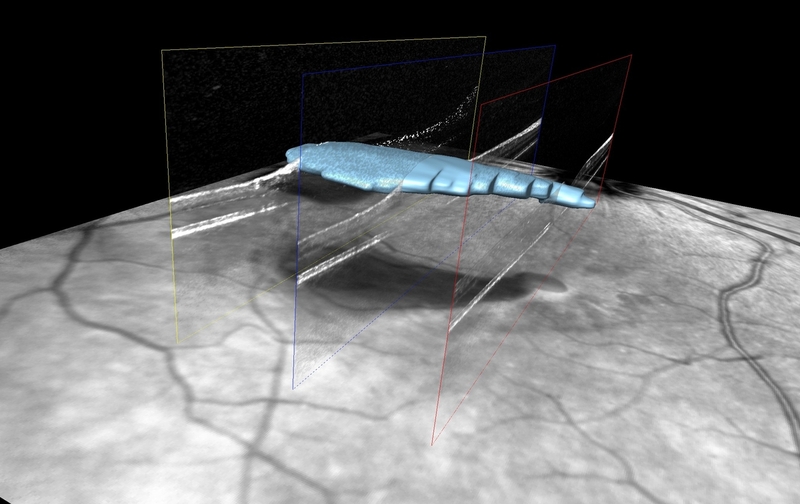 With associated software we can rotate the image in 3D space to give a unique view of the biological image maker that is the retina. Technical details : Image was acquired by a Multiphoton Laser scanning microscope FV1000 MPE with an Infrared red Ti:Sapphire Laser that is mode locked (femtosecond).